Above: Three Whitehead students whose notes from his classes have been preserved. Lewis Feuer was a sociologist who wrote a dissertation on space and time under Whitehead, and later wrote a widely used reader on Marxian thought. 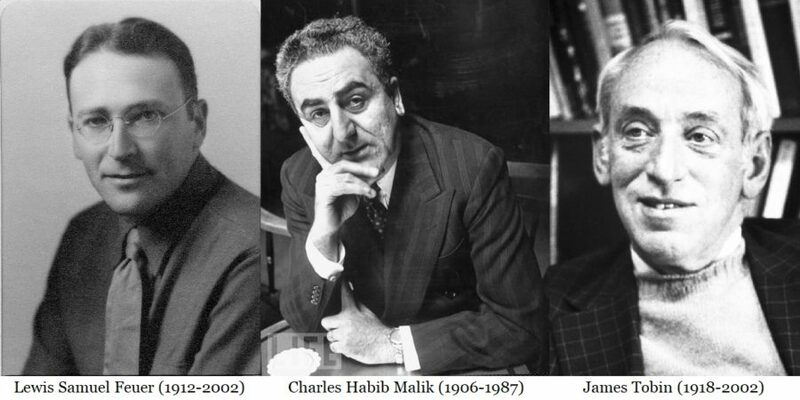 Charles Malik was a Lebanese diplomat to the United Nations, and helped draft the Universal Declaration of Human Rights with Eleanor Roosevelt in 1948. James Tobin was an economist who won the Nobel Prize in Economics in 1981. It’s time for another quarterly WRP update! I have been saying for some time now that we expected the transcription of notes for the 1930-33 volume to be complete before the end of the year. Now I can absolutely confirm that. Transcription of Thomas G. Henderson’s notes for 1932-33 is complete, and we are extremely close to finishing up the notes of Charles Habib Malik. We should be able to wrap that up by the end of October. Henderson recorded this final paragraph a little differently, but he has the exact same line about “artists, lovers, and lunatics.” It is quite a provocative statement, and I know of nothing like it in Whitehead’s published works. It goes to show that there is definitely worthwhile material in these thousands of pages of notes that we’ve been so busy transcribing. In the midst of wrapping up the transcription of these notes, I am presently formulating a plan of attack for transcribing Whitehead’s correspondence, as we have decided to forgo transcription of student notes for 1933-37 for at least a little while and focus on letters. Currently our project has 850 letters that are either to, from, or about Whitehead (though perhaps fifty or so are duplicates). They run the gamut in interest and importance, from wartime letters between the Whiteheads and their children (and Gertrude Stein/Alice Toklas, who became close friends with the Whiteheads just as WWI was beginning), to the recently acquired MacMillan correspondence, to reminiscences of Whitehead sent to Victor Lowe, to a thank you note from Eleanor Roosevelt, etc. We will have to decide which letters to prioritize, and also where a complete transcription of Whitehead’s gradebook might fit in with that plan, another thing that we have left unfinished while working on student notes. We have also made some new acquisitions. George Lucas did an east coast crawl of a couple of archives in the middle of September, including Johns Hopkins (the Lowe papers) and Brandeis (the Lewis Samuel Feuer papers… another Whitehead student). From Brandeis we will be getting more Lewis Feuer notes. From Johns Hopkins we have found seminary notes of Thomas Henderson from 1934 and 1936, notes of James Tobin from 1937, notes of Victor Lowe from 1935, plus various letters and photographs (including one of Evelyn in 1890, the year she married Whitehead, when she would have been just 24 years old). We also found Whitehead’s appointment book for 1925-26, which gives us a better idea of Whitehead’s average weekly schedule (for instance, when he typically had individual meetings with graduate students). We are also waiting for a scan of what is apparently a list of the books that were in Whitehead’s personal library. The editing of the second CEW volume covering 1925-27 also continues. The time-consuming textual verification phase has finally been completed, and we have moved on to editing proper, meaning that we are now working toward a finalized text which expands shorthand, adds explanatory footnotes, and points out important differences between the various sets of notes in order to most nearly approach Whitehead’s words. We believe that this next volume of the CEW will, like the 1924-25 volume, prove an invaluable resource to Whitehead scholars, covering as it does the period in which he wrote both Religion in the Making and Symbolism, and with his Gifford lectures only a year away.